You'll discover tucked-away gems like Praia da Aberta Nova and Pego Beach. Get a sense of the local culture at Castelo de S. Jorge and National Tile Museum. The adventure continues: wander the streets of Belém Tower, take in the views from Vasco da Gama Bridge, take in the spiritual surroundings of Jeronimos Monastery, and get engrossed in the history at Carmo Archaeological Museum. For photos, reviews, more things to do, and tourist information, use the Lisbon tour planner . If you are flying in from United States, the closest major airport is Humberto Delgado Airport (Lisbon Portela Airport). In August in Lisbon, expect temperatures between 86°F during the day and 63°F at night. Cap off your sightseeing on the 24th (Fri) early enough to go by car to Sintra. Kick off your visit on the 24th (Fri): take in nature's colorful creations at Quinta da Regaleira, step into the grandiose world of Park and National Palace of Pena, and then admire the striking features of Sintra National Palace. To see other places to visit, reviews, photos, and more tourist information, use the Sintra route planner. Sintra is just a short distance from Lisbon. August in Sintra sees daily highs of 85°F and lows of 63°F at night. Finish your sightseeing early on the 25th (Sat) to allow enough time to drive to Lagos. Start off your visit on the 25th (Sat): enjoy the sand and surf at Praia Dona Ana, enjoy the sea views from Lagos Farol da Ponta da Piedade, and then explore the striking landscape at Ponta da Piedade. Get ready for a full day of sightseeing on the next day: enjoy the sand and surf at Praia de Alvor, then enjoy the sand and surf at Praia do Camilo, and then take in the spiritual surroundings of Church of St. Anthony (Igreja de Santo Antonio). To find other places to visit, more things to do, where to stay, and more tourist information, refer to the Lagos trip builder . You can drive from Sintra to Lagos in 3.5 hours. Other options are to do a combination of train and bus; or do a combination of train and flight. In August, plan for daily highs up to 85°F, and evening lows to 68°F. Finish up your sightseeing early on the 26th (Sun) so you can go by car to Lagoa. Your day-by-day itinerary now includes Algar de Benagil. On the 24th (Fri), explore the ancient world of Castelo de Silves, Head underground at Algar de Benagil, and then enjoy the sand and surf at Praia do Carvalho. On the 25th (Sat), you'll have a packed day of sightseeing: enjoy the sand and surf at Vale de Centeanes Beach, enjoy the sand and surf at Pescadores Beach, and then enjoy the sand and surf at Praia marinha. To see photos, ratings, traveler tips, and more tourist information, use the Lagoa day trip planning tool . You can drive from Lisbon to Lagoa in 3 hours. Other options are to take a train; or do a combination of flight and train. In August, daytime highs in Lagoa are 85°F, while nighttime lows are 68°F. Wrap up your sightseeing on the 26th (Sun) to allow time to drive to Lagos. Kick off your visit on the 29th (Wed): take some stellar pictures from Pico do Ferro Viewpoint, head outdoors with Lagoa do Congro, then visit a coastal fixture at Farol Ponta do Arnel, and finally get great views at Viewpoint of Ponta da Madrugada. Get ready for a full day of sightseeing on the 30th (Thu): look for all kinds of wild species at Jose do Canto Forest Garden. To see more things to do, reviews, photos, and more tourist information, read our Furnas online tour itinerary planner . Getting from Lagoa to Furnas by combination of bus and flight takes about 15.5 hours. Due to the time zone difference, you'll gain 1 hour traveling from Lagoa to Furnas. When traveling from Lagoa in August, plan for a bit cooler days in Furnas, with highs around 77°F, while nights are about the same with lows around 65°F. Wrap up your sightseeing by early afternoon on the 30th (Thu) to allow enough time to drive to Ponta Delgada. Igreja de Sao Jose and Sinagoga Sahar Hassamain will appeal to history buffs. Step off the beaten path and head to Mosteiros Beach and Lagoa do Canario. 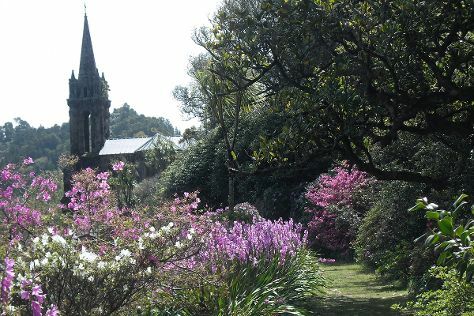 Step out of Ponta Delgada with an excursion to Sao Nicolau Church in Sete Cidades--about 30 minutes away. There's much more to do: contemplate the waterfront views at Lagoa do Fogo, make a trip to Pico Carvao, discover the deep blue sea with a scuba or snorkeling tour, and experience rural life at Ananases Santo Antonio. To find reviews, where to stay, photos, and more tourist information, go to the Ponta Delgada road trip planner. You can drive from Furnas to Ponta Delgada in an hour. Another option is to take a bus. In August, plan for daily highs up to 78°F, and evening lows to 65°F. You'll have a few hours on the 3rd (Mon) to wrap things up before traveling home.